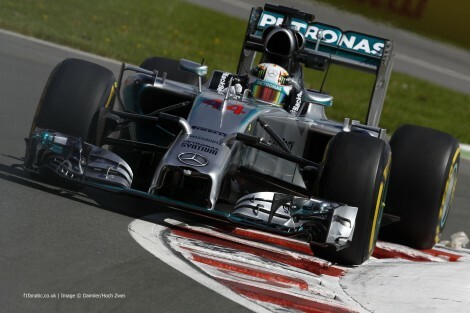 Formula One: Alonso and Hamilton fastest in Canadian practice! 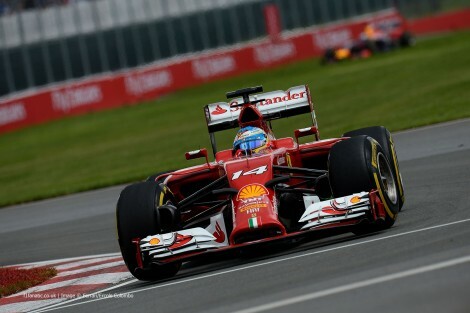 Home » Formula One: Alonso and Hamilton fastest in Canadian practice! Fernando Alonso and Lewis Hamilton were the two fastest drivers in Friday practice for the 2014 Canadian Grand Prix from the Circuit Gilles Villeneuve in Montreal. Fernando Alonso was surprisingly the fastest man in the first practice session at a circuit that many expect to be dominated by the Mercedes engined cars; particularly those belonging to Lewis Hamilton and Nico Rosberg. The gap may have been by a mere few thousandths ahead of the Silver Arrows pair, but it is encouraging nevertheless as many feared that the Ferrari and Renault cars may be disadvantaged this weekend. Sebastian Vettel was 4th fastest after the first 90 minute session, with the team refusing to take this as a sign of potential pace this weekend. The Red Bull cars are famed to lack top speed in favour of increased down-force, which was evident with both cars failing to appear in the top 10 fastest cars in the speed trap before the final chicane. Team-mate Daniel Ricciardo was 6th fastest, with both Red Bulls split by Valtteri Bottas in the Williams. The two McLaren’s of Button and Magnussen were 7th and 8th fastest, with Kimi Raikkonen and Jean-Eric Vergne in 9th and 10th. Kimi had suffered problems in this first session, with a radio message revealing that the team had noticed his engine was knocking, forcing him to return to the pits for a lengthy spell. He later returned to the track and set his time to put him in 9th. Vergne had also suffered technical problems during the session. The 9th and 10th placed drivers weren’t the only ones to hit problems, with Marussia’s points scorer Jules Bianchi hitting the wall at the turn 4, forcing his retirement from the rest of the session. Only one driver was substituting for a regular racer in this session, with American GP2 driver Alexander Rossi taking the wheel of Kamui Kobayashi’s Caterham for this event before returning to the cockpit in practice for the US Grand Prix in November. Rossi ended the session in last place but was only half a second slower than Ericsson in the sister car. The Mercedes drivers returned to their usual 1-2 positions in second practice, with Lewis Hamilton a tenth of a second faster than Nico Rosberg. The advantage between the Mercedes cars and their rivals was not as big as once feared, with Sebastian Vettel only 3 tenths off of Rosberg in the Renault powered Red Bull. The two Ferrari’s of Raikkonen and Alonso were 4th and 5th, with Kimi having an eventful session which included a strange spin on the exit of the hairpin. The Williams and McLaren cars came in two by two in positions 6 to 9; with Massa and Bottas followed by Magnussen and Button. Magnussen was involved in a potentially messy situation at the final chicane where he almost collided with Adrian Sutil while slowing to start a lap. The incident was briefly investigated but no penalty was given. Jean-Eric Vergne was in 10th fastest once again after suffering a trip down the turn 3 escape road after a lock-up. Marcus Ericsson had also taken a trip down that escape road earlier on in the session after suffering a technical problem. Team-mate Kamui Kobayashi was back in his car after lending it to Alexander Rossi in FP1. It was seemingly taking a while to get back into the rhythm for the Japanese driver after several lock-ups at the hairpin and at the final chicane, along with a major sideways moment at turn 2. He ended the session ahead of his Swedish team-mate, with Jules Bianchi last after completing only 4 laps following from his affair with the turn 4 wall in FP1.